This book is dedicated to Darren Lennon and all the other children and young people in care I have been fortunate to know, as well as to the memory of those who died too young. I thought to explain to Charles, in an email, the reason I chose this verse of poetry for the dedications page, as I realise that many readers may not immediately, or ever, comprehend why I made this choice. Poetry is after all highly subjective in how it is composed and interpreted. Charles then suggested that I expand upon this email and write a piece for the journal to accompany his review of the book. What follows is the result. When you get to reading the book you may wonder why I chose the verse from W.B. Yeats’s poem ‘The Stolen Child’ for the dedications page and I thought that I would give you a brief accounting as to why I chose it, to afford you insight into my thinking in matching this poem with this book. So the fairies beguile or entice the child into willingly going away with them and escaping a ‘world that’s full of troubles and anxious in its sleep’ by employing the allure of adventure, sweet berries and camaraderie but in reality the children are stolen from this world never to ‘see the kettle on the hob again’. I have had the folklore of fairies instilled in me since childhood, both in school and culturally, in rural Ireland. I acquired a deep-seated appreciation for the cultural meaning-making role of the stories of fairies and ‘other world’ entities that still today are embedded in the psyche of rural Irish people and likely urban dwellers too. We have a common expression here in Ireland for someone who is not paying full attention to something or on the same page as others on certain matters; we say that they are ‘away with the fairies’ meaning that they are in a world of their own or daydreaming. This demonstrates that the cultural acceptance of the concept of fairies is a widespread phenomenon here in Ireland and perhaps further afield. Rationally I may know some things are facts and others myths but still, I know also that there is more to this world than ‘meets the eye’, just as there is the conscious, subconscious and unconscious mind. We are very fortunate here in Ireland, I believe, to have a landscape still dotted with fairy forts and earth rings with trees, often whitethorn, growing in the middle. To this day no farmer will tamper with these structures or cut these trees because of either respect for our shared cultural heritage or for fear of upsetting the fairies and suffering the consequences. I take pride in passing this lore to my children, the younger ones, now in the emerging wisdom of adolescence, deride my stories of fairies and the like but all the while they are absorbing these stories which I know they too will, in due course, pass on to their children. This, I am conscious, is key to our identity formation and I am keen to pass on to my children what was passed on to me. I know they will pass this on just as I know that much of the work undertaken by me, and countless other social care workers, with children in care may not ‘evidence’ itself by bearing fruit until long after we have parted company. I do, however, wonder how children in care are impacted by the fragmentation to their identity formation through deficits in areas such as this. It is partly the personal narrative that connects us to each other and creates a sense of belonging. As Bruce Perry has said: “Without a life story, a child is adrift, disconnected and vulnerable”. But it’s not the folklore aspect of this poem alone that resonates with me. It is also pain, loss and sadness that effects this resonance. I lost my father at age 12 and it took many years for me to come to terms with this loss. He was stolen from me and also from the promise of his own life which he had worked hard to create. Yet he still lives within me, partly through the stories and cultural heritage he passed on to me. He played a key role in shaping my identity and these stories connected me to my cultural heritage and afforded me a deep sense of belonging. I connected with my tribe, across generations, which added the ‘we’ to ‘me’, m(w)e, thereby multiplying the ‘me’. The engendering of a sense of belonging for children in care is, I believe, one of the core challenges of social care practice and no more so than for those separated children in care. I have always been struck by the line ‘for the world’s more full of weeping than you can understand’ which speaks to me of immense sadness and hurt which I can identify with through my own experience of the loss of my father, whilst also resonating with my curiosity as to the other aspects, elements or dimensions to this world, including those within the professional domain, that may not ‘meet the eye’. 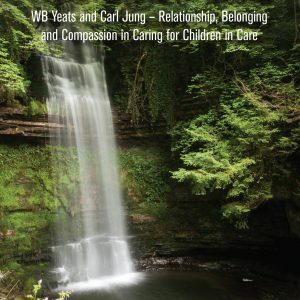 I introduce the personal to this professional communication as I feel that this is appropriate and is in line with what I have advocated within my book on Social Care and Child Welfare with regard to the place of the private, personal and professional aspects of self in our practice. My experience working with children and young people, predominately in residential care over the past 20 something years, causes me to see little distinction between a young person who dies by suicide or who dies by drug or alcohol overdose, as so many do. It is shocking that, in Ireland, 25% of all deaths from non-natural causes, including suicide, for children and young people in care and aftercare over a 23 year age span, occur within one year, at age 18. Additionally shocking is the fact that, for young people in aftercare, non-natural deaths outnumber natural deaths by a ratio of 5:1. This confirms that it is the stress and lack of preparation and thereafter support for young people who have left care at 18 that is the major cause of these deaths. Loneliness and stress are under-acknowledged malignant realities for many of these young people; the cause of much self-sabotaging behaviour. Our current care system means that those who most need support are likely to receive the least as they are less likely to engage in education or training. When they most need care and support, at age 18, it is not available to them. This is a classic example of an ‘inverse care law’. These young people who die by overdose have often experienced such rejection and alienation that they seek the only solace or ‘escape from a world full of troubles’ they can find in drink and/or drugs and, in my experience, their deaths are often closely linked to being at a very low ebb and filled with hopelessness and despair; so I see little distinction between such a death or suicide. Both are born of unbearable pain, hopelessness and despair. The sheer waste of a life that should have been full of promise but instead is full of pain is heartbreaking. I think Yeats captured this in his line ‘for the world’s more full of weeping than you can understand’ as who could ‘understand‘ such pain sufficiently that they can live with it! Yet many in fact do including those care leavers who often have the least successful care trajectories yet struggle on to survive as best they can. They may remain marginalised by, and excluded from, society yet remarkably many go on to overcome this. This is the true resilience and I am in awe of the capacity of those who overcome such adversity. I like to think that some of their resilience has rubbed off on me vicariously; counterbalancing the vicarious trauma and vulnerability I know I have also experienced. But not all have such fortitude, personality characteristics, social and economic support networks or perhaps good fortune. Those young people who tragically die in this transition, I believe, have had the promise of their future lives stolen. Stolen from them and us and we, as a society, are the poorer for it. Stolen first by abuse, neglect and/or abandonment most often within their families and then the eradication of their hope through repeated broken promises and failure to adequately care for them when removed from these families, followed by the lack of support and opportunity on leaving care and finally by rejection and stigmatisation. So, for me at least, there is a strong sense of connection between Yeats’s stolen child beguiled away by the fairies and these young people beguiled away by drink and/or drugs; both are vulnerable and are seduced by false promise, ultimately, and tragically, ending up stolen from this world. It is for this reason I chose this poem. So whilst there have been many improvements in care and aftercare, particularly in the past decade, it is those at the margins that I most identify with as these are the ones I have known over the years while working in residential care and aftercare; those children and young people that are largely ‘hidden from the public view’- out of sight and out of mind. It may be that I too find their pain vicariously unbearable but it is certainly true that I find the social injustice unacceptable. However, I won’t seek to deny the professional and cognitive dissonance these feelings and emotions induce by solely attempting to intellectualise, theorise or rationalise them into acceptable or manageable frameworks in pursuit of the often misunderstood concept of ‘being professional’. I have learned from the lengthy and painful process of coming to terms with the death of my father that the denial of feelings and emotions only brought more and greater pain into my life and that only by accepting, owning and staying with painful feelings and emotions was resolution to be found. Therefore, I recognise that to deny the feelings of dissonance, in this case, would also be to deny the injustice perpetrated on so many care leavers and prolong their pain. I believe that feelings and emotions are inalienable to genuinely caring for another human being and I agree with Nel Noddings who has said that ‘if a child does not feel they are being cared for they are being treated as an object’. The risk of objectification is exacerbated within an increasingly commodified and constrained environment where the social professions function. Political influence and the use of language are key drivers in such processes where, for example, people become clients or service users and recording and reporting mechanisms geared to generate statistical data have become onerous yet commonplace within practice. I believe the reification of that fabled state labelled ‘objectivity’ has the potential to lead to the compartmentalisation (or suppression) of bonafide emotional responses and a denial of the reality that hurt can be a price of caring. Such prejudice favours those who may have no or limited experience of caring or who have practice experience but can no longer tolerate the emotional cost of caring. In a Bourdieusian context the question is are those who write the rules for, or referee, ‘the game’ (social care/work) predominately those who are no longer capable of the feelings that afford ‘a feel for the game’ and if this is the case is the game rigged to validate and align with their agendas, and thereby protect their various forms of capital, at the expense of authentic relational caring? Sometimes it is as simple as right and wrong and our feelings and emotional responses as decent human beings can play a key role in assisting with the differentiation of this distinction. Feelings and emotional responses can reveal what otherwise may not ‘meet the eye’. Whilst essential for the expression of empathy with another human being there are also the actions which these feelings and emotions may inspire that must be appreciated. In this context it is not the feelings or emotions themselves that are the most important factor, it is actions that count, but if we deny the feelings and emotions in the first instance then we also deny the potential for the sorely needed actions they may prompt. Actions essential to improve our current incongruent system of care which results in such tragic and unconscionable outcomes for too many care leavers. I believe that the lack of recognition for the importance of feelings and emotions also tends to pathologise the righteous place of passion in social care and I am proud to say I love my profession. I also believe that the role of feelings and emotions (and intuition), as well as that of dialogue within the process of turning theory into practice (praxis) requires re-evaluation. As I advocate within the book much of the professional self is also the personal self and, of course, both are political – and in today’s globalised world the professional, the individual and the political are also universal. Also, with specific meaning for this book and its relevance internationally, we know that the local now also have global meaning. So, for now, I will continue to come to terms with this dissonance of caring for these most marginalised and downtrodden young people utilising what I learned from the process of coming to terms with the dissonance caused by the death of my father. I have, after all, first-hand evidence of what has actually worked and, for me, there can be no more robust evidence than this – lived experience. This, in my opinion, is as true a ‘gold standard’ of research as the Random Control Test. It is my reality and I know my own truth. I know also that this is my truth and not everyone else’s, but then, the individual (the human child) is also universal. This ‘evidence’ has taught me that my capacity to embrace my vulnerability is one of my most valuable assets in my practice as a social care professional and, somewhat counter-intuitively, I have come to recognise that what I had been socialised to regard as a weakness, vulnerability, has in fact often been my greatest strength. In conclusion, it is actions like writing this book, professional activism and a belief that it is better to try and fail than to fail to try that are part of my coping mechanisms in this ongoing process. Noddings, N. (1996). Caring: A Feminine Approach to Ethics and Moral Education, Berkeley, University of California. Shulman, L. (1999). The Skills of Helping: Individuals and groups, Illinois, Peacock.